What kind of amp should I use? Any kind. Guitar and instrument amps are fine as are "hi-fi" amps. At the bench we often use small single unit amp/speakers from Radio Shack. Do I have to burn a PROM? No. The electronics kit includes a burned prom. The code is available on our website for educational purposes and to allow the adventuresome builder to start from scratch. Is the FatMan Mono or Poly? 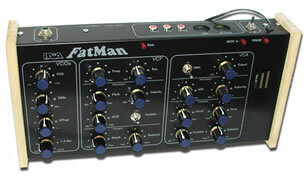 The FatMan is a mono (one note at a time) synth. Do you have a MIDI Implementation chart? Does the FatMan send midi data from the knobs? No it does not. There is a MIDI Thru on the FatMan panel to allow easy chaining of several devices (for some builders a chain of FatMans) but no MIDI Out is available and knob and switch positions are not encoded. How many presets does it have? The FatMan has no presets. Parameters are controlled non-digitally in real time by the knobs. Is the FM V/Hz or V/oct? The FatMan is scaled V/Hz. The CV outputs on the front panel can correctly control Korg, some Yamaha and older PAiA modular synths but in general cannot provide accurate pitch when controlling MOOG, ARP, Sequential and other V/oct. scaled gear. The CV, Velocity and Gate outputs are the same as are controlling the FatMan, so while you can double a line, you cannot play two separate parts. What kind of MIDI source do I need? Anything that speaks standard MIDI is an appropriate controller You can often find keyboards from Casio and others at national discount chains for good prices ($100 - $200) and you usually get several dozen very useful digital voices at the same time. Phil McNutt of Austin writes: "In case folks ask about a midi controller keyboard in the future, tell them to look at the "QuickShot". I bought one for $99, and it comes with cakewalk software to boot. Nice keyboard." And Cakewalk is not the only sequencer, there is a wide selection of powerful and easy to use computer sequencers, many available online as shareware or freeware: We've had a builder recommendation of a reasonably priced one from "Technotoys" that simulates the legendary TB303 sequencer. It's difficult to estimate building time because of individual differences in skill level, experience and so on. We've heard times ranging from 6 hours (incredibly short) to 40 hours (incredibly long). There's more on this topic in the "General FAQ". Back to FatMan catalog page.